A group of Honduran migrants are detained along the U.S.-Mexico border by Mexican police after attempting to cross the border barrier into the U.S. In a prime-time address from the Oval Office on Tuesday night, President Trump said there is a "growing humanitarian and security crisis at our southern border." Aid groups agree that what is happening on the border meets the definition of a humanitarian crisis. 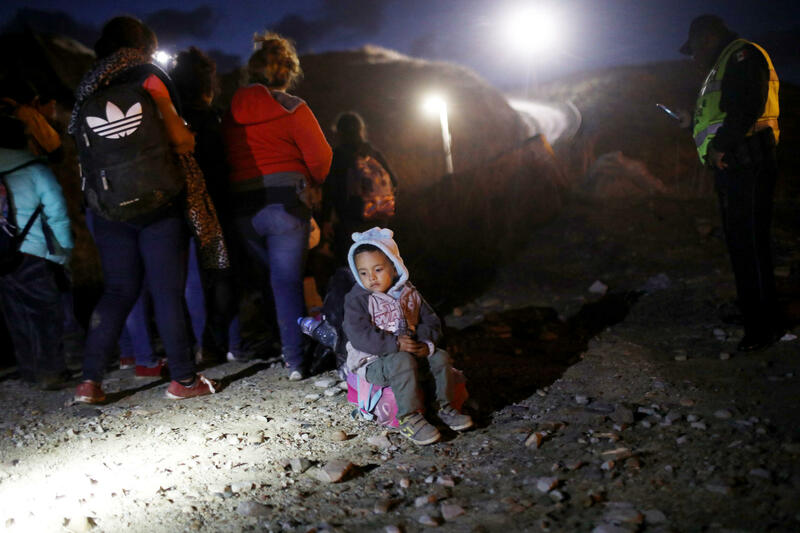 Thousands of migrants are fleeing Central America to seek asylum in the U.S., a journey that puts many at risk of health problems and human trafficking as well as detainment by U.S. authorities. But some in the global aid community are outraged that Trump used the term "humanitarian" to describe the crisis without pledging any action to alleviate the suffering — and are alarmed that he's using the situation as a bargaining chip to build the border wall. Across Twitter, relief groups spoke out. Some aid researchers say that Trump's role in creating the crisis strips him of the moral authority to call it a "humanitarian crisis." "It's as if a mobster threw a brick through a window and said, 'Boy, there's a lot of crime,' " says Jeremy Konyndyk, a senior policy fellow at the Center for Global Development and the former head of international disaster response for the Obama administration. "If you're the one causing the crisis, the simplest and right thing to do is to stop what's causing it," he says. But Paul Spiegel, director of the Center for Humanitarian Health at Johns Hopkins University, reminds the aid community that immigration was a problem before Trump took office. "This situation is not all because of Trump. The problem's been around for a long time. We just don't have sufficient policies to deal with immigration," he says. And he says that by using the term "humanitarian crisis," Trump is indicating that there are humanitarian needs that need to be addressed. "It could speak to his acknowledgement of the human suffering on the border," he says. "It could be a good thing to call it a 'humanitarian emergency' if that means getting more support and provide sufficient care [for the migrants]," he says. That's what is supposed to happen when a humanitarian emergency is called, says Konyndyk. He shares an example of the Rohingya refugees seeking asylum in Bangladesh. "You provide support or ask international groups to step in and help you. You extract people from danger. Provide them with their basic needs. Give them a way to legally reside in your country," he says. But as the toll of this crisis adds up — there has been a spike in crossings in the past few months, topping 60,000 in both October and November, according to NPR — the expectation is that there will be a continuing "crisis of the heart and a crisis of the soul" as Trump put it in his 9-minute Tuesday night address.